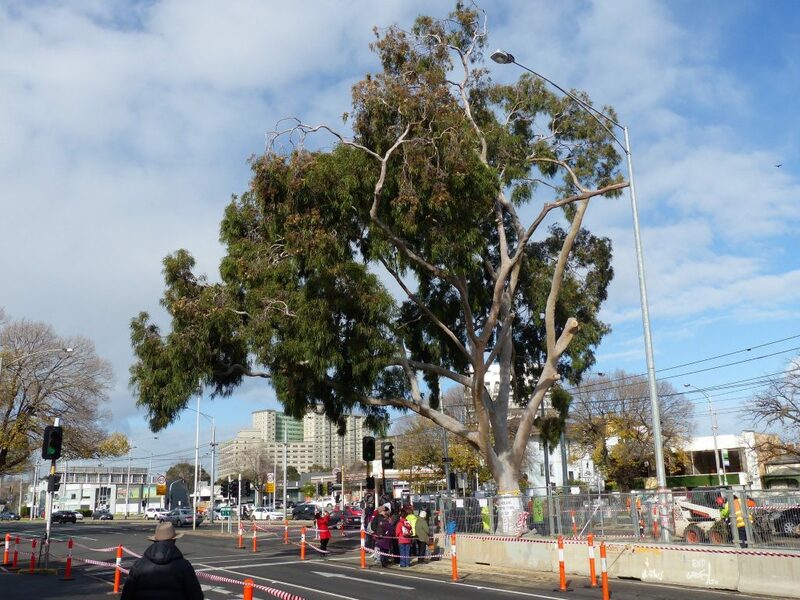 Update: Flemington Road gum tree still standing, but for how long? Published on June 30, 2016. MEETING NOTICE: Tomorrow, Saturday 2 July at 7am, friends of the Lemon-scented Gum are again meeting at the tree outside 120 Flemington Road to organise community efforts to save the tree. If you are concerned about the future of the tree, please consider attending this meeting. It not expected that tree works will happen this Saturday (although it is possible), but locals are keen to meet up and share information and ideas. 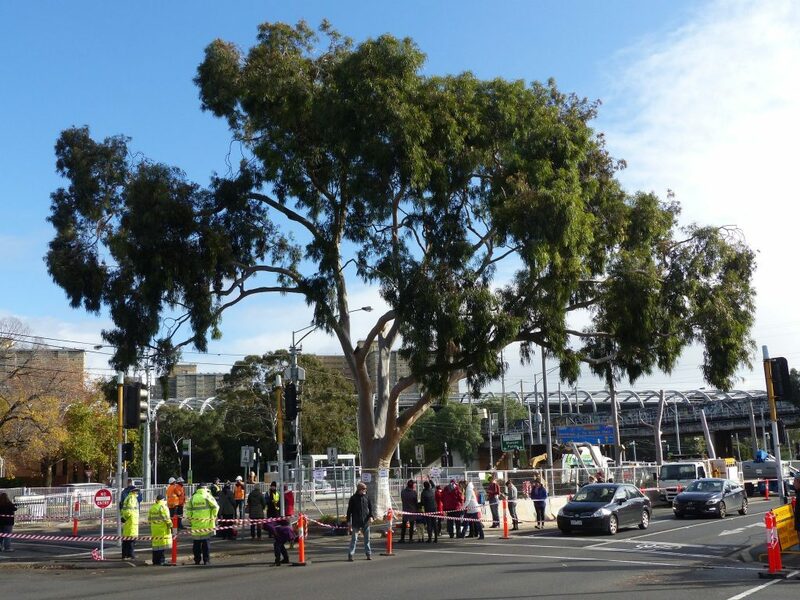 Last Saturday 25 June, dozens of people turned out before dawn to show their support for the Lemon-scented Gum on Flemington Road. Click here to read our previous post about how it got to this point. The Lemon-scented Gum now has it’s own twitter account, and it documented the events of the morning of 25 June (see images at the bottom of this article). Thanks to community action by Ann and Allan Read and others, works on the tree stopped after four hours with only 40% of the canopy removed. The Flemington Road gum tree after works were stopped on Saturday 25 June. The reverse angle is shown at the top of this post. VicRoads have confirmed we will not be told when the works will recommence. 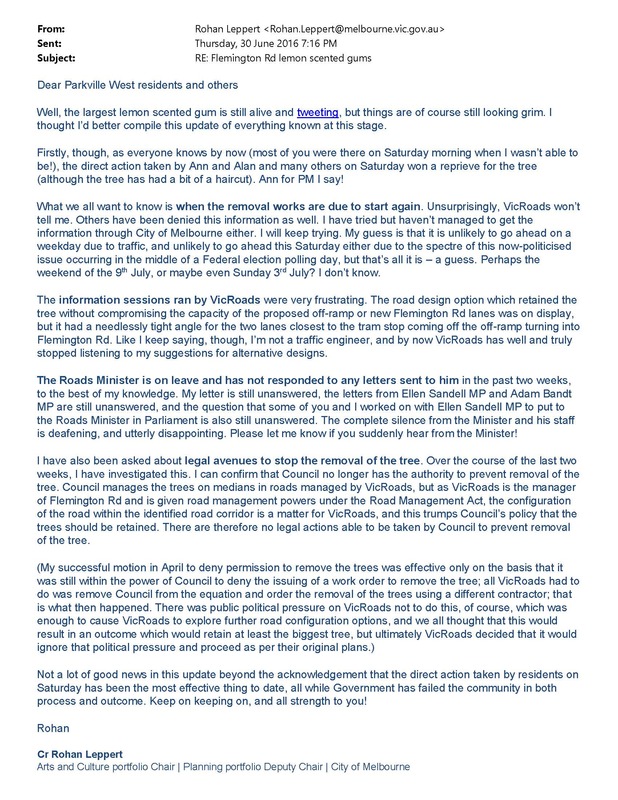 The National Trust wrote to the Roads Minister Luke Donnellan on 17 June but we received no response before the Minister went on leave this week. Our subsequent request for a meeting with one of the Minister’s advisers has as yet been unanswered. The CityLink Tulla Widening project has an updated webpage with some basic information and their technical documents. It is important to remember that VicRoads have legal powers under the Road Management Act to remove the tree. VicRoads and Transurban have now excluded City of Melbourne from the process by going around the Council and engaging an external contractor for the works. This is well-explained by City of Melbourne Councillor Rohan Leppert, who wrote to concerned constituents this evening with a comprehensive summary of the situation since Saturday. Click the text to read a larger version of the email. Why not send the tree an email? Now would be a good time to send the tree an email telling it why you love it and why you want it to stay. It’s got its own address and will sometimes reply. You can email the tree at melbourneurbanforest@melbourne.vic.gov.au and make the email subject ‘Information about a Lemon Scented Gum, Tree ID 1020559’. Contact the Roads Minister and express your concern. You can email luke.donnellan@parliament.vic.gov.au or call the Minister’s office at (03) 8392 6150 and his electorate office at (03) 9706 0566. Your messages are the best way to tell those in power that you disagree with the trees’ removal. The lopping last weekend reduced the canopy of the significant gum by 40%, but we’ve had arborist advice that it is likely the tree could recover from the works last Saturday. The Minister’s has the power to stop the chainsaws from returning to finish the job in the very near future, and we hope he responds to community concern before it’s too late. Want to see more pictures from last weekend? Here’s a photo record of events as they unfolded last Saturday 25 June. If you’d like to see more photos, click here to view the Friends of Moonee Ponds Creek photos on facebook.